Lucien Schevalas was born in Obonne, Switzerland. Swiss park designer, gardener of royalties. He graduated from the Forestry Institute in Paris. He came to Bulgaria after the Liberation in 1878. He was invited by the General Governor of East Roumelia, knjaz Alexander Bogoridi (on the special recommendation by the Sultan), to come to Plovdiv and design parks and gardens. He created the Knjaz (Royal) Garden next to the central office of the general Governor. After the Unification (1885), he was in charge of the Municipal Gardening Office. Lucien Schevalas designed the parks of the First Bulgarian Agriculture and Industrial Exhibition (1892) - from that period remained the now-central garden, later called the Tsar Simeons Garden (todays Central Garden of Plovdiv); the Plovdiv City Garden (also known as the Dondukov Garden) - next to todays Museum of Natural History; the Pepinniere (also called Schevalas Nursery Garden) - near the railway station; he also afforested the Bounardzhik Hill and the Sahattepe Hill. After creating magnificent parks in Plovdiv, and being called the minister of flowers, he died in his beloved city in 1921. 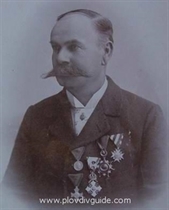 He was declared Honorary Citizen of Plovdiv in 1901.